Close to shopping, dining and entertainment options at Queensway Shopping Centre, IKEA Alexandra and Alexandra Central. 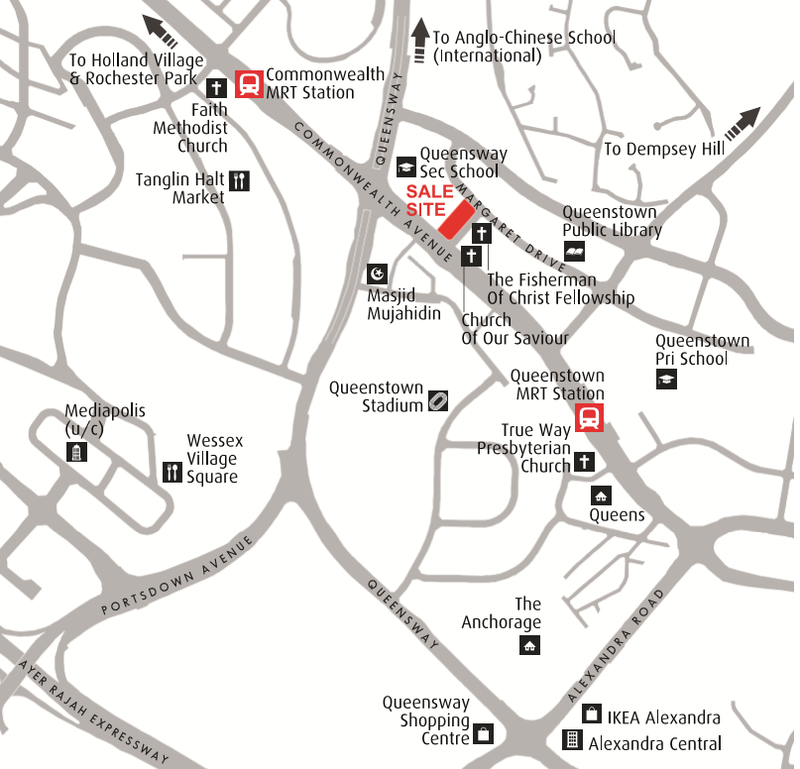 Lifestyle clusters such as Holland Village, Rochester Park and Dempsey Hill are also a short drive away. Convenient for families with school-going children, schools such as Queenstown Primary School, Queenstown Secondary Shool and Anglo-Chinese School (International), are located within the vincinity. SINGAPORE — A private housing site in Margaret Drive attracted a strong response from developers, with the highest bid of S$238.39 million coming from MCL Land, showed Urban Redevelopment Authority (URA) data at the close of tender on Tuesday (Dec 6). The 99-year leasehold site was made available on the Reserve List of the Government Land Sales (GLS) programme for the second half of 2016. Located near the Commonwealth MRT station and close to the Ayer Rajah Expressway, the site sits on 4,809.8 square metres and can yield a maximum allowable gross floor area of approximately 22,195 sq m, the URA said. This is equivalent to 238,905 sq feet that can be developed into about 275 homes. In addition to transport connectivity, residents of the project to be developed on the site will have a wide range of shopping, dining and entertainment options at Queensway Shopping Centre, IKEA Alexandra and Alexandra Central, a hotel, and a retail development currently under construction, the URA said. The tender drew 14 bids from developers due to its attractive location and manageable size, and the strong participation may prompt the Government to make available more land for residential development, property analysts said. 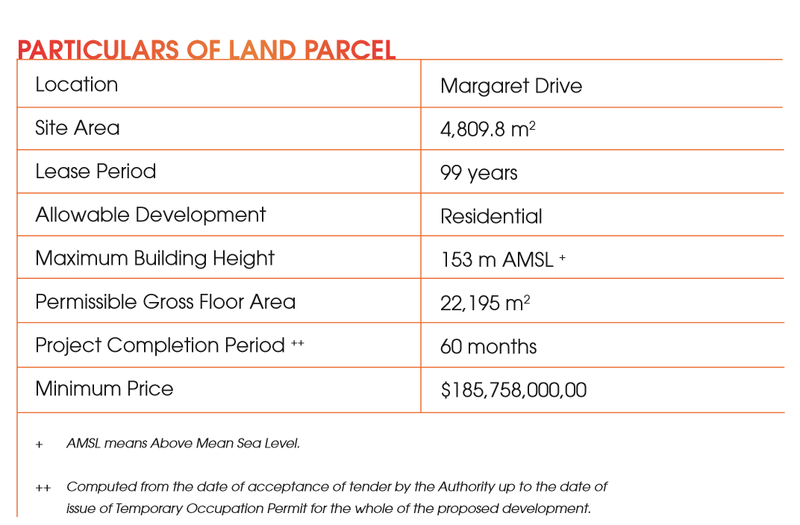 MCL’s bid for the Margaret Drive site translates into S$997.85 per sq ft per plot ratio. “The top bid is quite bullish as it is 14.5 per cent higher than the land price of the land parcel on which (the nearby) Queens Peak site was sold in June 2015 at S$871.14 psfppr, even though the subject site is further away from the MRT station. The top bid for the subject site was the second highest among all the submitted bids for the GLS residential sites since 2009,” Mr Mak said. The new condominium could be launched at above S$1,700 psf from late-2017 to early-2018, he added. For more information on Margaret Drive Condo By MCL, simply fill up your details below and our salesperson will get in touch with you shortly!